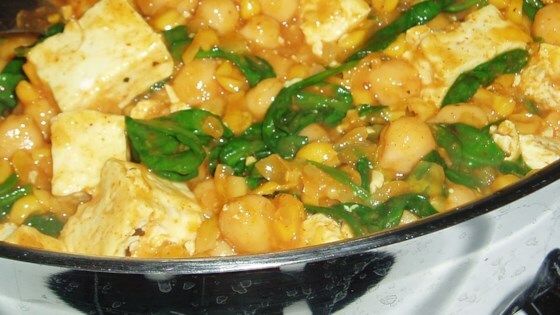 "A quick delicious Indian-style curry with spinach, chickpeas, onions, and/or whatever veggies you have. I have added cauliflower, potatoes, and sweet potatoes to this recipe in the past. All were very good. Serve with nan, pita or rice if desired." In a large wok or skillet heat oil over medium heat; saute onions until translucent. Stir in creamed corn and curry paste. Cook, stirring regularly, for 5 minutes. As you stir, add salt, pepper and garlic. Stir in garbanzo beans and gently fold in tofu. Add spinach and cover. When spinach is tender, remove from heat and stir in basil.